Home Pregnancy Clearblue Digital Pregnancy Tests – Who Are They Kidding? 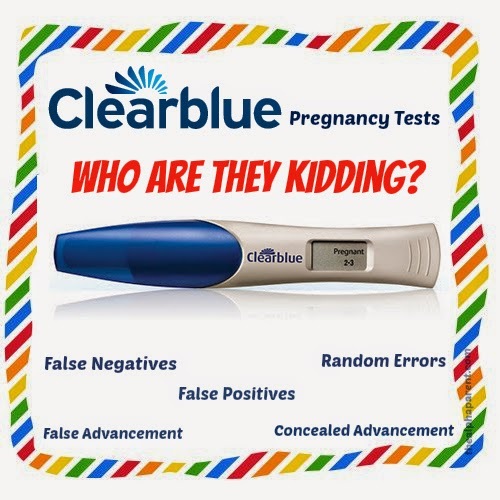 Clearblue Digital Pregnancy Tests – Who Are They Kidding? You’ve probably had the displeasure of viewing it before, but if not, you can view it here. It’s obvious that this commercial is aimed at first time preggos; as any veteran breeder would instantly dismiss it as patronising hyperbole. To start with we meet ‘Claire’. We are told by the on-screen text that she is a ‘Clearblue Expert’. I have no idea what one of those is, but they must be pretty senior because her office appears to be from the set of Star Wars and Star Trek combined. In this Jedi office she has some phat widescreen HD TVs showing ultrasound scans. Just in case you are unfamiliar with the appearance of an ultrasound, the TVs helpfully say “SCAN” in block capitals. The scene then switches to a doctor in stereotypical ubiquitous white lab coat and specs. This is a common tactic used by companies to suggest the scientific character of their product. Nestle used it with their infamous milk nurses (see here) –basically they put sales people into nurses uniforms to give the illusion that they were genuine medical professionals. It appears to be an effective strategy. Place average Joe Bloggs in a uniform and it inspires trust and confidence in the viewer. Check out the doctor’s office – he’s got nothing on Claire of course, but his place of employment is far from shabby. It looks like he works in an inner-city penthouse with gleaming glass windows, five-star view and he has a flair for interior design. Harley Street – eat your heart out. But wait, why is the doc looking at x-rays in a pregnancy test ad? As the commercial assumes its audience are ignorant noobs who are unfamiliar with ultrasound scans, it shows the doc sticking scan images onto a lighted screen, as they do with x-rays (because x-rays are common medical procedures and even retarded people who what they look like). This adds extra medical beef to the advert. We are told that: “one of the reasons doctors use an ultrasound is to date your pregnancy”. Firstly, sonographers use ultrasounds rather than doctors, but I’m guessing Clearblue assume that would be too confusing for the target audience. Besides, doctors tend to be of higher rank and so carry more prestige. Secondly, why all the emphasis on ultrasounds? The Clearblue digital pregnancy test is even less accurate at dating a pregnancy than fundal measurements (I will discuss accuracy bellow). It is much, much less accurate than an ultrasound yet the advertisement has ultrasounds all over the place suggesting correlation. That’s not to mention that the dating ultrasound also looks for measurements, foetal heartbeat, Downs, the existence of twins, to name a few enquiries; and furthermore – it’s free. These digital tests are the steep end of a tenner. Back to Claire now. We see an uber-modern levitating screen complete with tech sounds. These features suggest the product’s advanced-nature; i.e. ‘This merchandise is so badass, look how futuristic we are’. Claire smacks of smugness; she raises her eyebrows at the levitating screen then smirks at us as she explains the obvious. Finally we see the actual pregnancy test being advertised. It also levitates – not bad for a stick you pee on. Clearblue proudly claim that this test can be used four days prior to your period being due. I believe that this exploits anxious women and can have devastating consequences. For instance, it’s estimated that up to 50% of pregnancies are lost in the very early stages. In the past, most women did not even realize they were pregnant – their periods would arrive on time. Now women testing very early, as encouraged by Clearblue, may get a positive test, but experience bleeding almost immediately afterwards. This is an early miscarriage, also referred to as a ‘chemical pregnancy.’ It is likely that the woman did conceive and the embryo implanted for a short time before dying. I argue that it is irresponsible marketing to encourage women to test early. This may be one reason why the Clearblue digital pregnancy tests have been documented to have an abnormally high rate of false positives. A brief Google search reveals mass heartache. Other causes of false positives include taking certain fertility medications, hormones left over from a recent pregnancy, or in some cases by menopause or ovarian cysts. For women carrying twins, the test can indicate that the pregnancy is more advanced than is actually the case. This is because the test measures the level of HcG (human chorionic gonadotropin) hormone and uses this calculation to determine how far along the pregnancy is. HcG is a hormone detectable in pregnant women’s blood or urine about 10 days post-conception; it increases at a rapid rate, peaking about 10 weeks into the pregnancy. Unsurprisingly HcG levels are higher in twin pregnancies however the Clearblue digital pregnancy test interprets these higher levels as pregnancy advancement rather than twins. The opposite of false advancement, the test can often proclaim that a woman’s pregnancy is less advanced than it actually is. Hormone levels are higher first thing in the morning, lower in the evening, fluctuate when a woman is on medication, depend on the concentration of the urine, not to mention different for everyone. In fact, if you search around on the official Clearblue website, it even admits that “the level of hCG varies from woman to woman, and it is therefore possible that the Conception Indicator might occasionally give misleading results.” Believing you are only 2-3 weeks along when you are actually 8 weeks can be inconvenient at best, and at worst, distressing. For instance, a lot of women use the test as a reassurance tool to indicate that their pregnancy is progressing as it should be. When a test inaccurately suggests that the pregnancy is less advanced than the woman expects, this misleading information can be worrying, particularly for women with previous miscarriage. Being an electronic device, the product is more prone to malfunction. Women have reported the display window persistently displaying the timer along with ‘not pregnant’ with a * underneath it and 3+ weeks underneath that. In short, dating a pregnancy is best left to a professional, not a money-making gimmick. To quote peeonastick.com, if you are concerned or wish to monitor the advancement of your pregnancy, please do it properly – under a physician’s supervision, with a blood test at a lab – not at home with a pee-stick. And if you ever see Claire, give her a slap from me. Previous articleWho is best to parent? Boys or girls?